Glamorize your home décor with this striking collection of rectangle glass coffee tables. Featuring clear glass top with a variety of table frames, these coffee tables are stylish, elegant while not compromising on the quality and making. The frames of these rectangular coffee tables are made either from metal, wood or glass to offer you great choice with style. Archie Coffee Table is simple yet classy. It will elevate the beauty of your room décor manifold with its elegance. With posh finesse and bold curves, the Archie Coffee Table offers grace and a lot of functionality to your living room. 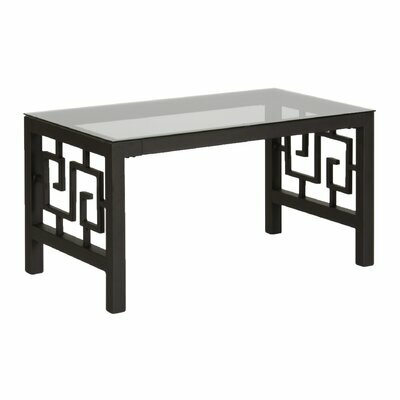 It is made entirely from semi-tempered glass that lends strength to this table. The sled type base gives this coffee table extra firmness on the floor. Complete your plush sofa set by placing it at the center and intensify its beauty a notch higher. The shiny finish and immaculate cuts add character to its appearance. This lightweight coffee table is easy to carry and low on maintenance. To keep the shine intact, clean this table with mild glass cleaner and avoid using harsh chemical cleaners or detergents. Accentuate the décor of your home with the unique and spectacular Caila Coffee Table. This coffee table attains perfect mixture of aesthetics and functionality. Symbolizing durability and elegant style, it is manufactured from premium quality materials. The iron base and legs feature antique gold leaf finish that add an imperial touch. This coffee table stands on beautifully designed legs. A mirror sit stop the table frame for an unconventional look. 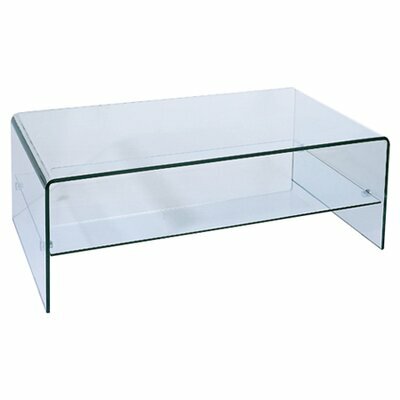 The table top and lower glass shelf are made from tempered glass for long lasting durability. Place this coffee table in your living room or guest room and adorn it with decorative items for a completely gorgeous look. Bring chic and stylish update to your living room with the gorgeous Saniya Coffee Table. 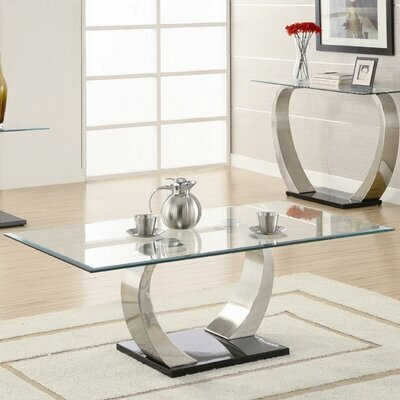 This contemporary styled coffee table features metal frame in gleaming chrome finish and tempered glass top. A lower exterior shelf serves as a convenient storage space for keeping magazines. The textured high-gloss shelf can also be used as a display shelf for decorative items. Bring gardening fun indoors with the unique and maverick design of Aldridge Terrarium Coffee Table. It features clear glass panels and black metal frame with silver distressing for an enchanting look. Ideal for growing lowlight houseplants and succulents for enjoying refreshing and soothing environment indoors. 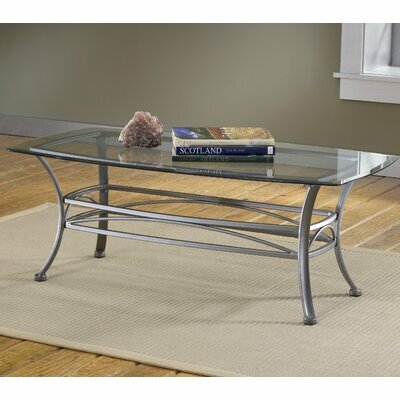 This coffee table is also perfect for showcasing your fondest and most cherished memories or keepsakes. The unique and outstanding design of this coffee table will take away the breaths of your guests and leave them mesmerized with the idea of capturing treasurable moments with family and friends around this coffee table. 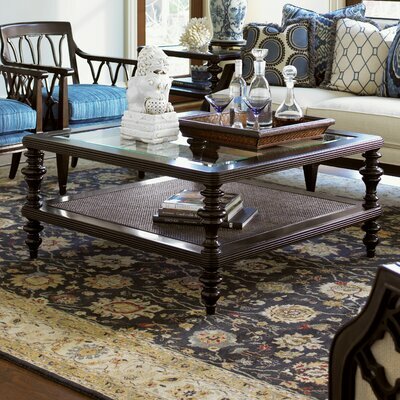 Add style and prestige to your home with the Lexington Mirage Russell Coffee Table. The cool and gleaming look with elegant geometric patterns combines to create an amazing piece of furniture. The clean rectangular lines and the silver sheen of polished metal base showcases a spectacular and artistic look. The ultra-clear glass on top add appealing detail to its overall look. This classy coffee table is built from superior quality of tube stock steel making this exquisitely designed table an object of unsurpassable strength and durability. Perfect for contemporary themed home interiors, the stunning Mirage Russell Coffee Table from the house of Lexington will provide humble ambience to your home décor. Glamorize your home décor with the chic style of Seth Coffee Table in Black. Featuring high sheen black base with striking curved metal legs, this gorgeous coffee table will adorn your contemporary home décor. A floating beveled glass top completes the look of this stunning coffee table. Place it in the center of your living room or guest room and impress your guests with its stylish look. Accentuate the décor of your home with the impeccably designed Ryder Coffee Table with Storage Shelf. It is manufactured entirely from tempered glass for additional strength and long lasting durability. Featuring no-tint, clear glass, this elegantly designed coffee table showcases a refreshing and simple look. 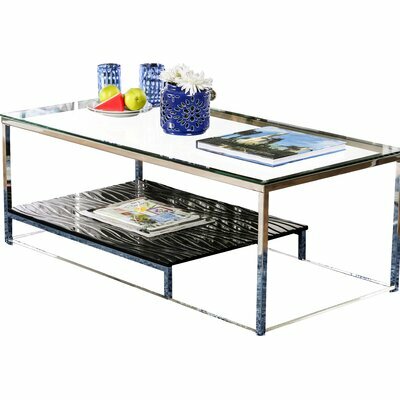 The waterfall bent glass frame and rectangular shape give this table a simple yet modern touch. This highly functional coffee table comes with a lower shelf that is perfect for placing magazines, newspapers, fruit basket or flower vase. This lovely coffee table is low on maintenance. You can wipe it clean with the help of damp cloth to maintain its gorgeous and glossy finish. The contemporary Greek Key Coffee Table from the house of In Style Furnishings will be a valuable addition to any contemporary themed room décor. Beautifully designed with Greek key accents, this deep bronze coffee table is sure to impress your friends and guests with its gorgeously stunning look. Featuring powder coated steel frame and tempered glass top, the lovely Greek Key Coffee Table will add stylish touch to any room décor. Give a stylish flair to your home with the chic look of Abbington Coffee Table. 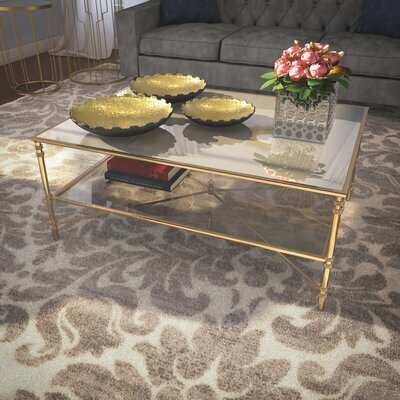 Featuring elegant scrollwork, muted pewter finish and gracefully curved legs, the sophisticated yet subtle style of this coffee table is hard to miss. Place this coffee table in your living room and complete the set with the console table and glass topped end table for a perfectly stunning room décor. Sophisticated and luxurious, Royal Kahala Tropic Coffee Table will take your breath away with its imperial look. Named after the picturesque oceanfront enclave on the Island of Oahu, the mesmerizing look of the Royal Kahala Tropic Coffee Table will enchant you. Exquisitely designed out of Ribbon Stripe Mahogany, this coffee table from the house of Tommy Bahama Home exudes an air of romance and intrigue. Simply gorgeous, the inset glass top allows the eye to enjoy and appreciate the appealing woven wicker shelf below. This coffee table is a stunning fusion of exotic natural materials and eclectic design with distinctive finishes to glamorize your home décor.